Have you ever been watching a movie or video, or maybe you’re in a coffee shop or restaurant, and you hear a song or some music that you want to identify? 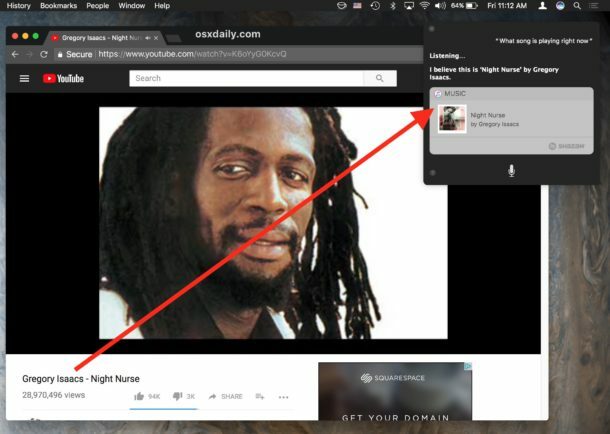 If you’re on your Mac, your computer can recognize what songs are playing by using Siri. This is essentially the feature that also works to identify what song is playing by using iPhone or iPad, but it’s on the Mac, and allows for identifying songs playing from the same hardware. This obviously requires a Mac with a modern Mac OS release with Siri support as well as a microphone, so if you don’t have Siri on the Mac you won’t have this capability on your computer. And yes, the internal microphone works fine for picking up songs that are playing out of the computers own built-in speakers. This works great to identify songs or music when watching a show or movie on Netflix or Amazon Prime, or even something you hear in a YouTube video, elsewhere on the web, or on Facebook or Instagram. That iTunes automatically opens after Siri has identified a song is a little strange and annoying, but there does not appear to be a way to disable that from happening so you’ll either have to quit iTunes or just ignore it. Oh and by the way, if you have Windows 10 on a PC, Mac, or Virtual Machine, and have Cortana, Cortana can also identify music playing too on request. 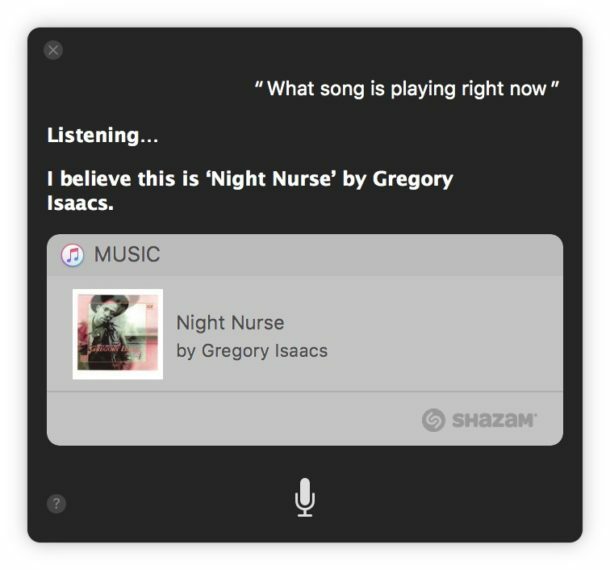 Or you can pickup and use an iPhone or iPad to ask Siri to tell you what song is playing as well. This is just one of may abilities available with Siri, check out the Siri commands list for Mac and the Siri commands list for iPhone and iPad too, there is some overlap between the two but because Mac OS and iOS are different each has unique Siri functions available to their respective host operating systems too. Does asking siri work with Alexa? I am not sure if Alexa can identify music as I do not have an Echo nearby, only a bunch of Apple gear. You would have to ask ALEXA to see if it knows a song or two. Let us know! Haha! I didn’t know you could do this. GOOD BYE Shazam! !